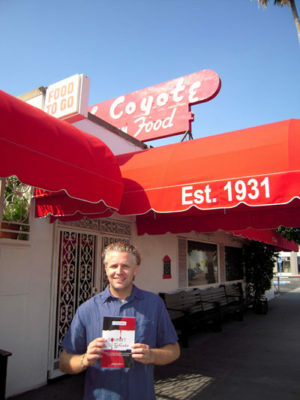 EL COYOTE is among sites in James Bartlett’s new book. James Bartlett happened on the idea for his new book “Gourmet Ghosts” at a bar, which, he was told, has a ghost. He hasn’t exactly seen a ghost since he’s published the 274-page historic look at the city’s mysterious past. But he’s heard some good stories, sampled L.A.’s eclectic fare and sipped assorted beverages at 40 restaurants, hotels and bars. He’s also learned quite a bit about the city’s dark side. The British journalist sought to show a different side to the city he learned about when he was a tourist. He wanted to document actual places where you can go inside and cozy up to the bar and decide for yourself if there’s a ghost or at least have a cocktail and something good to eat. He poured over microfilm in the downtown Central Library and read through Hearst newspaper stories with salacious headlines (the “Velvet Tigress” is among notorious cases). “People don’t really poison each other like they used to. And they used to do it a lot,” he notes. Besides newspaper reports to back up the story, eyewitness accounts were also helpful. He struck up conversations with bartenders and valets, employees who’d been around a while. While many of the alleged ghosts were victims of murder still at the scene so to speak, others just didn’t seem to want to leave. Just ask Vince behind the bar at the Formosa Café. He’ll tell you his grandfather is still there bossing the staff around. Celebrities frequented many of the haunts, some of which date back to the prohibition era. HMS Bounty opened as “The Gay Room” in 1921. Bartlett recommends the “Wise Man” drink special (a beer and a shot of whisky) along with a daily selection of hearty fare. At the Original Farmers Market, Bartlett frequents EB’s Bar, named after Earl Gilmore, whose father Arthur Gilmore’s “life changed overnight when he accidentally struck oil on the site in 1905.” As the legend goes, Arthur and Earl, while passed, continue to stay on at the site, assuring its continued success. A personal favorite haunt of his is the revolving bar atop the Bonaventure Hotel. “There’s not many left,” he notes. A grissly, cocaine-related murder here in the 1980s assures a spirited tale. To this day the parking attendants stay away from a corner of the basement where “strange noises” are reportedly heard. As downtown parking is expensive, Bartlett recommends www.metro.net to find a ride. “Enjoy a drink while saving yourself time and money,” he writes. Bartlett and his wife Wendall, a UCLA professor, live within walking distance of El Coyote Café, whose ghost story includes a beautiful waitress.